Internationally acclaimed poet Fay Zwicky, whose breakthrough work Kaddish describes her life as a secular Jew, has died in Perth aged 83. 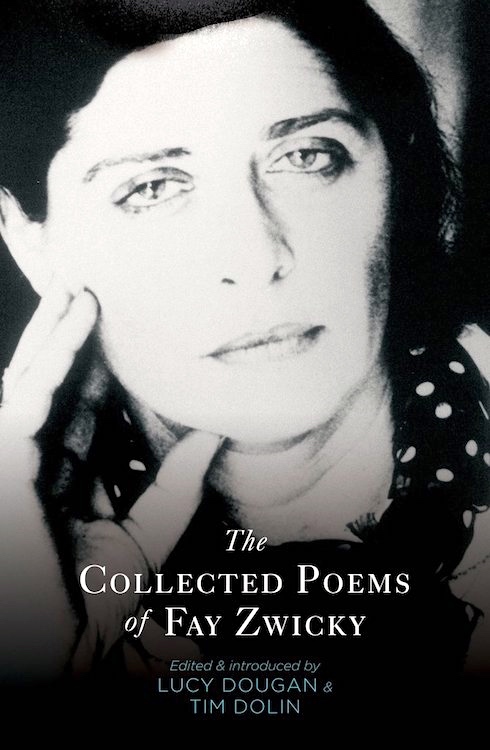 Her 700-page book The ­Collected Poems of Fay Zwicky was launched on Saturday by [Univ. of Western Australia] Press. UWA Press director Terri-ann White said Zwicky had a powerful reputation. “There’s great aesthetic to the language in her work but there is also this very distinctive voice that drives everything that she’s written,” she said. Born in Melbourne in 1933, Zwicky was a contemporary of Dorothy Hewitt at the University of WA. As a lecturer of literature, her students included poets John Kinsella and Paul Hetherington and novelist Gail Jones. She is survived by daughter Anna, who lives in Britain, and son Karl, an Australian film ­director and screenwriter who produced the current ABC series Janet King. Recurrent themes of Zwicky’s were the relation between art and the artist, the exploration of the author’s Jewish heritage and autobiographical experiences. … Zwicky’s first collection, Isaac Babel’s Fiddle (1975) included a number of poems about her Lithuanian grandfather and his cultural displacement in Australia, which nevertheless saved him from the Holocaust (“Summer Pogrom”, “Totem and Taboo”). Zwicky also writes of her own alienation, in spite of her being “whiter than Persil”. Ask Me, Zwicky’s third book of poetry, contained poems on China, America, and a series of religious poems on the deities of the Hindu pantheon (“Ganesh”, “Vishnu”, “Siva”, and the goddess “Devi”). In Zwicky’s subsequent books she developed a sparser style of poetry. In the title poem of The Gatekeeper’s Wife Zwicky wrote of the devastating loss of her [second] husband [James Mackie], and recalls the custom of lighting a memorial candle. In “Losing Track” the death of her husband is linked with the tragic Jewish loss of Zion. The collection included an elegy, “Banksia Blechifolia”, for Primo Levi, and “Groundswell for Ginsberg”, an homage to Allen Ginsberg. Her latest collection of poems, Picnic, published in 2006, gathered primarily poems about the nature of poetry and the poet’s role in the world. Aside from her poetry, Zwicky published a collection of short stories, Hostages, in 1983, and a collection of essays on literature and survival, The Lyre in the Pawnshop, in 1986. In her essays Zwicky traced the ways in which the construction of an Australian literature has served to marginalize minority writers and women. She discussed the absence, until very latterly, of any place for a Jewish writer in Australian literature: “Living and growing up in this country has been an exercise in repression”. Two things to follow up on: the genus Banksia (and the botanist for whom it’s named) and Primo Levi (and his masterpiece The Periodic Table). 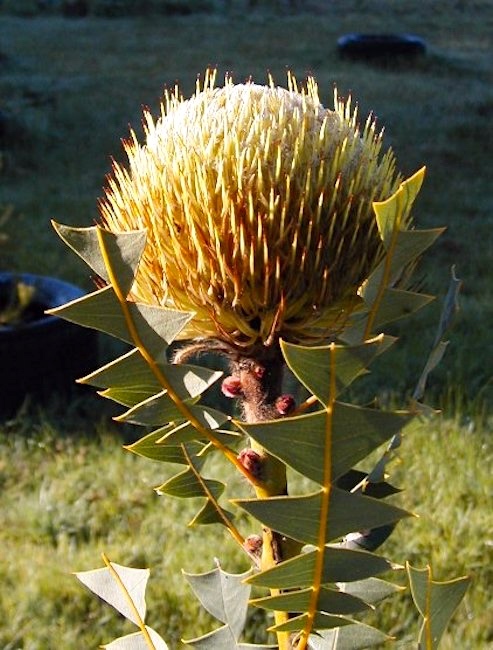 Banksia is a genus of around 170 species in the plant family Proteaceae. These Australian wildflowers and popular garden plants are easily recognised by their characteristic flower spikes and fruiting “cones” and heads. Banksias range in size from prostrate woody shrubs to trees up to 30 metres tall. They are found in a wide variety of landscapes; sclerophyll forest, (occasionally) rainforest, shrubland, and some more arid landscapes, though not in Australia’s deserts. … Specimens of Banksia were first collected by Sir Joseph Banks and Dr Daniel Solander, naturalists on the Endeavour during Lieutenant (later Captain) James Cook’s first voyage to the Pacific Ocean. Cook landed on Australian soil for the first time on 29 April 1770, at a place that he later named Botany Bay in recognition of “the great quantity of plants Mr Banks and Dr Solander found in this place”. Over the next seven weeks, Banks and Solander collected thousands of plant specimens, including the first specimens of a new genus that would later be named Banksia in Banks’ honour. Four species were present in this first collection: B. serrata (Saw Banksia), B. integrifolia (Coast Banksia), B. ericifolia (Heath-leaved Banksia) and B. robur (Swamp Banksia). In June the ship was careened at Endeavour River, where specimens of B. dentata (Tropical Banksia) were collected. Blechifolia is a groundcover that spreads to 2m and can cope with a wide variety of soil types. Primo Michele Levi (31 July 1919 – 11 April 1987) was an Italian Jewish chemist, writer, and Holocaust survivor. He was the author of several books, novels, collections of short stories, essays, and poems. His best-known works include If This Is a Man (1947) (U.S.: Survival in Auschwitz), his account of the year he spent as a prisoner in the Auschwitz concentration camp in Nazi-occupied Poland; and his unique work, The Periodic Table (1975), linked to qualities of the elements, which the Royal Institution of Great Britain named the best science book ever written. Levi died in 1987 from injuries sustained in a fall from a third-story apartment landing. His death was officially ruled a suicide [apparently motivated by survivor’s guilt], but some have suggested that the fall was accidental. … The stories are autobiographical episodes of the author’s experiences as a Jewish-Italian doctoral-level chemist under the Fascist regime and afterwards. They include various themes following a chronological sequence: his ancestry, his study of chemistry and practising the profession in wartime Italy, a pair of imaginative tales he wrote at that time, and his subsequent experiences as an anti-Fascist partisan, his arrest and imprisonment, interrogation, and internment in the Fossoli di Carpi and Auschwitz camps, and postwar life as an industrial chemist. Every story, 21 in total, has the name of a chemical element and is connected to it in some way. The Wikipedia article has a full list of the stories. This entry was posted on July 4, 2017 at 9:08 am and is filed under Death notices, Language and plants, Names, Poetry, Zwickys. You can follow any responses to this entry through the RSS 2.0 feed. You can leave a response, or trackback from your own site.